There are two ways to access the Forum. One way is by signing up to post and receive messages via email ("subscribing"), and the other is by visiting the Forum’s freely accessible public web archive. If you wish to participate in Forum discussions, you must first subscribe to the Forum by clicking the "Join List" link available on the Forum’s homepage. Once you have confirmed your subscription, you will receive instructions about how to participate in Forum discussions and manage your subscription. 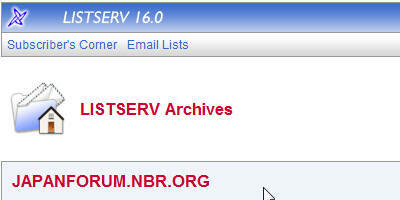 Users who have not subscribed may only read messages via the public web archive. PLEASE NOTE THAT ALL MESSAGES POSTED TO THE FORUM WILL BE MADE AVAILABLE VIA THE FORUM’S FREELY ACCESSIBLE PUBLIC WEB ARCHIVE. As a condition of your use of the Forum, either as a subscriber or as a reader of the web archives, you agree not to use the Forum for any purpose that is unlawful or prohibited by these Terms. You may not use the Forum in any manner that could damage, disable, or overburden NBR, the moderator(s), or Forum members. You agree to use the Forum only to post, send and receive messages and material that are proper and related to the purposes of the Forum. By way of example, and not as a limitation, you agree not to send chain letters, solicitations, or virus warnings, or emails that contain copyrighted material, inappropriate language or viruses. The moderator(s) and NBR exercise sole discretion in determining what and when to post, and may choose not to post content submitted to them or ask the message author to remove such content and resubmit. NBR AND THE MODERATOR RESERVE THE RIGHT TO REMOVE ANY INDIVIDUAL FROM THE FORUM LIST. NBR considers the logs or records of its discussion forums (or web displays of those records) to be an archive for use by scholars and the public. Submitting material to the Forum perpetually licenses NBR to distribute and permanently archive that material for nonprofit, educational, or scholarly purposes through whatever media it owns, controls, or licenses. Any further use of such material beyond NBR requires the permission of the copyright holder, subject to the statutory exclusions defined by fair use, including quoting, citing, or excerpting for nonprofit, educational, or scholarly purposes with proper attribution. It is the responsibility of the copyright holder to preserve and enforce the copyrights. Although requests for removal or retroactive removal of posts from this archive will be considered, generally only material that presents a clear and present danger to an individual, that is legally libelous or defamatory, or that is a violation of applicable copyright, will be removed once it has been posted, at NBR’s sole discretion. Subscribers should not submit a message that contains material the subscriber does not, or in the future would not, want publicly available. As user of the Forum, you may download content for your personal, noncommercial use. You may not sell or modify content or publicly display, distribute, or otherwise use the content in any way for any public or commercial purposes without written permission from NBR. If you wish to reproduce a message posted to the Japan Forum (e.g., for posting on another website or inclusion in a publication), you must first request permission and provide a brief description of how the content will be used and displayed. 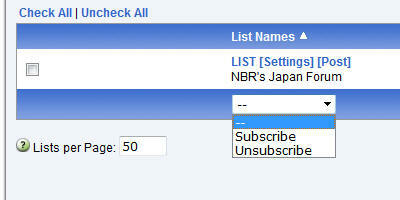 Please send your request to NBR at japanforum@nbr.org. NBR will relay your request to the message’s author and any other copyright holders as appropriate. By these functions, the moderator and NBR do not condone or endorse any content posted to the Forum. To subscribe to the Forum, individuals must submit their full name and their email address. When posting to the Forum, individuals should sign their message with their full name. When receiving messages, Forum members will see the name of the author in the "From" section of the post, but, to help keep personal email addresses private, the system will replace the author's email address with the generic address "jfmember@nbr.org." Please note that our system cannot account for every possible email header format, and very occasionally a member's email address might be visible to others. If this possibility is a concern, we recommend subscribing to the Forum using a secondary email address. Please also note that any personally identifying information in the body of a message to the Forum (e.g., in a signature line) will not be removed. Although English is the primary language of the Forum, the Forum software and moderating processes also support Japanese. Japanese language support facilitates the participation of native Japanese speakers in Forum discussions and allows Japanese words or quotes in members’ comments. NBR does not translate member postings, but rather allows a mixed-language environment. From annual Japan Forum member surveys, NBR has learned that most members are comfortable reading both English and Japanese, but they are much less comfortable writing in both English and Japanese. A member has the option of writing a message in either language, depending on the member’s preference. Attachments (included embedded images) will not be posted to the list. Instead, individuals should provide the posting as text in the body of a message. Members should not submit full text of articles or any other copyrighted materials to the Forum. Users who wish to share copyrighted material should provide a brief summary of the material, complete source information, and, when possible, an Internet link to the full text. To cancel your Forum subscription, please send an email from your subscribed email address to LIST-signoff-request@JAPANFORUM.NBR.ORG. Alternatively, you may login to the Japan Forum website, select "Subscriber's Corner," select "Unsubscribe" from the dropdown menu, and click "Submit." Comments, questions, or complaints about the Forum should be addressed to the Moderator (jfmoderator@nbr.org) and/or the Administrator (japanforum@nbr.org). THE FORUM IS PROVIDED ON AN "AS IS, AS AVAILABLE" BASIS. UNDER NO CIRCUMSTANCES, INCLUDING NEGLIGENCE, SHALL NBR BE LIABLE FOR ANY INCIDENTAL, SPECIAL, OR CONSEQUENTIAL DAMAGES THAT RESULT FROM THE USE OF OR INABILITY TO USE THE FORUM. NOR SHALL NBR, ITS SPONSORS, OR ANY CONTRIBUTORS TO NBR, BE LIABLE FOR ANY LOSS, DAMAGE, OR EXPENSE SUFFERED BY MEMBERS OF THE FORUM AS A RESULT OF OPINIONS OR VIEWS EXPRESSED IN THE FORUM. OPINIONS EXPRESSED IN THE FORUM ARE SOLELY THOSE OF THE CONTRIBUTING INDIVIDUALS AND DO NOT REPRESENT THE VIEWS OF NBR, ITS SPONSORS, OR ANY CONTRIBUTORS TO NBR. NBR IS NOT RESPONSIBLE FOR CASES OF FALSE REPRESENTATIONS OR IMPERSONATION.